Wiener Schnitzel, Jaeger Schnitzel, German Meatballs, And Homemade Gyros, What's Not To Love? 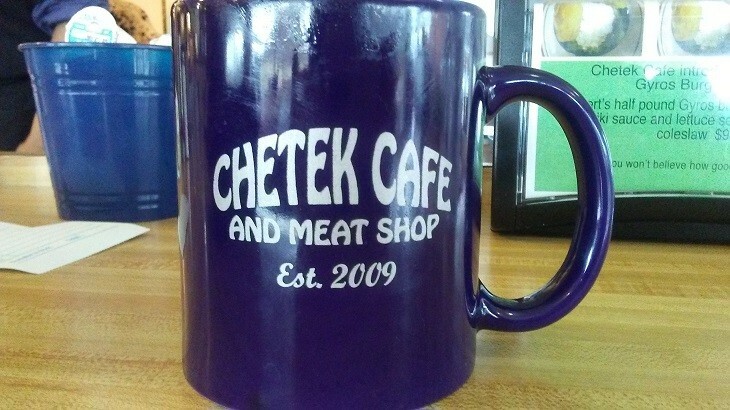 If you've ever been in the town of Chetek on a Saturday or a Sunday between 8a and noon, you would have noticed that there is often a line of people outside waiting to get into the Chetek Cafe. It's just a small cafe in a relatively small town off State Highway 53. You don't realize just what a gem this place is until you step inside and smell the German food. Norbert Wojke is from Germany and has been cutting meat since he was fifteen years old, spending five days a week learning the art of butchering and the sixth day in class. As a profession for years and he would spend four days in the butcher shop and then one day in University where he learned everything there was to know about sausage making. The students learned about the meat and the fat and casings, and they also learned about the spices that went into the sausage. Not just, 'this is pepper, this is salt.” They learned where the pepper was grown and what it's properties were as well as every other spice they used. 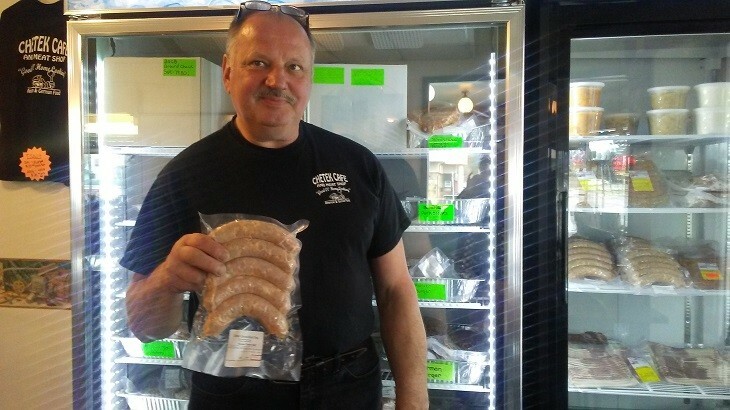 Norbert has created several of his own sausages, and when you attend the Saturday and Sunday breakfast buffet or order breakfast sausage with a meal, it's his personal recipe. Norbert spent five years in school and then five years in the German Army. While in the Army, he met a soldier from Greece who invited him to visit. While in Crete, Norbert was introduced to gyros. He fell in love with the product and exchanged some of his recipes with his friend. That's why there's a Greek Omelet, a Black Forest Delight, a Hercules Platter and a Pita Gyro on the menu. Did I mention there is also a Gyros Pork Burger? 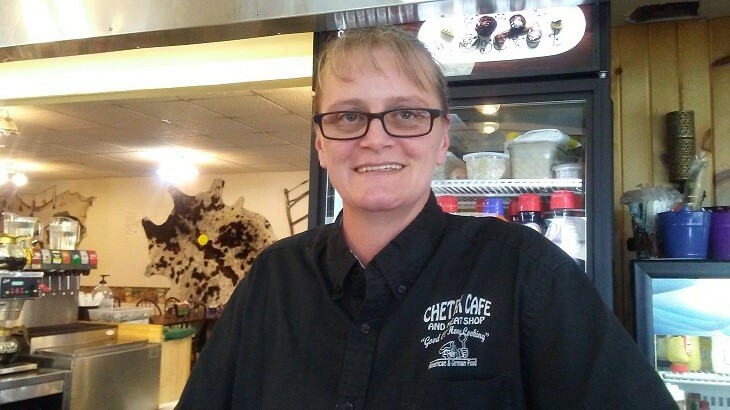 Norbert's American wife, Patty, has been in food service practically all her life. She comes from a family with eleven children, so chaos and crowds don't phase her as she wields her tools on the grill for their breakfast and lunch crowd. The Cafe is only open from 6a until 2p Tuesday through Sunday, and it's closed Monday. Their catering service of American/German/Greek Food is available for groups from 10 to 300 people, and there is a cooler in the restaurant stuffed with meat products from both Barney's Famous Butcher Shop just down the road where Norbert worked, and Homemade Sausage and German Specialties made by Norbert. You can buy cut-to-order ribeye steaks, buffalo meat and more from the restaurant cooler and they'll even ship their products nationwide for you. If you're wondering how all this began. . . Norbert owned a restaurant in Germany, and one evening there were a group of guys from the United States that were at the bar next door who had car trouble. Norbert took them home and housed them overnight, and a relationship blossomed. They were from Cameron, Wisconsin and they invited him to visit their area. He did. 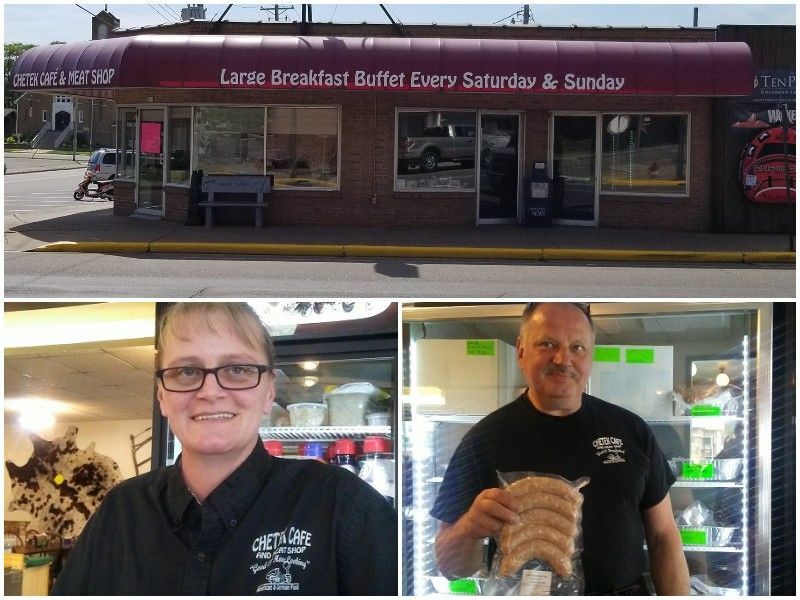 He's been in Chetek ever since, married, and owner of the Chetek Cafe and Meat Shop, and former butcher for Barney's Meats for twelve years. Norbert and Patty formerly owned a small restaurant down the block, but when this current building, on Second and Douglas Streets became available, they moved to the new location that had room for forty more customers. Several of the tables are set up as they are in Germany, long, communal and friendly. 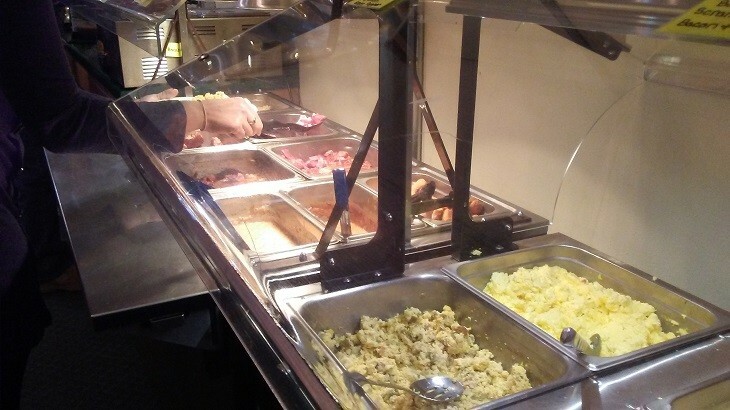 Three kinds of scrambled egg dishes, sauerkraut, German potatoes, thick cut bacon, German breakfast sausage, Kassler Rippehen, pork steak with mushrooms and onions, Jager gravy, Norbert's sausage gravy, biscuits, pastries, pancakes and there's always stout German coffee by the cup or the pound. Tuesday through Friday the menu is stuffed full of American/German, and Greek items almost too many to mention. Not only can you get a Black Angus Sirloin Steak with your eggs, but you can also get a beautiful Ribeye or Holzfaeller Pork Steak. Naturally, lunch and breakfast sauerkraut as a side is always available. If you want to taste authentic German food, this is your best place to go. After all, Norbert's family has been in the meat/sausage business for 300 years, and his sausage, meats, and restaurant have been listed as number one on Trip Advisor for five years in a row. 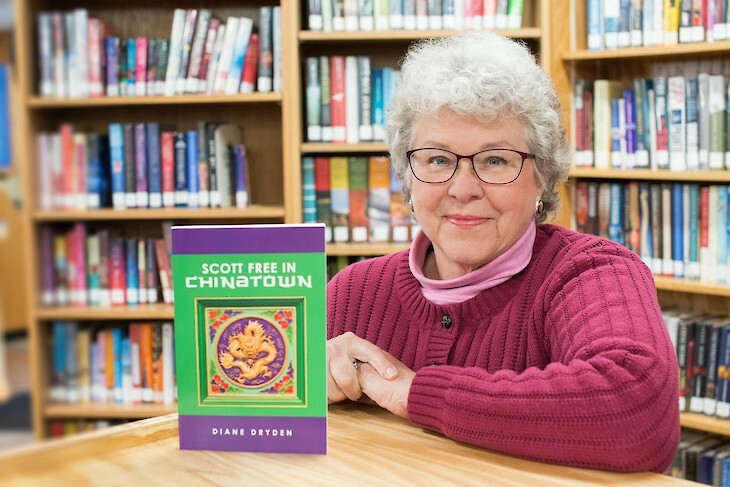 It's worth the forty-five-minute drive to get to Chetek, and after you've eaten, you can work off your meal with a stroll around this town with so many interesting places to stop. If you need more information, contact them at 715-925-2244 or chetekcafe.com.